If you're looking into creating your very own capsule collection and you don't know how and where to start, I suggest you go for timeless items that you can augment with seasonal pieces to create different looks. When the A-line skirt trend stole summer, I scoured different shops to look for the perfect fit, cut and wash. Good thing I chanced upon this little piece of wonder at a Penshoppe store tucked away neatly on a shelf next to a pile of denim shorts. I wanted to do arabesque right then and there, i kid you not. haha! And because I was rotting away in a corner of my closet trying to figure out what to pair this with (and my husband getting a little impatient because it was taking me forever to decide) I went ahead and gave the double denim a try. Well, not that it's the first time that I've tried the trend but it was my first time to do it in this wash. I usually go for the darker shade but im happy that this turned out quite well. When wearing double denim, one can also break the monotonous look by wearing a belt or, just go raw and wear it as it is. Capsule collections should give you the comfort of knowing you have pieces that you can mix and match, giving you different looks without breaking the bank. 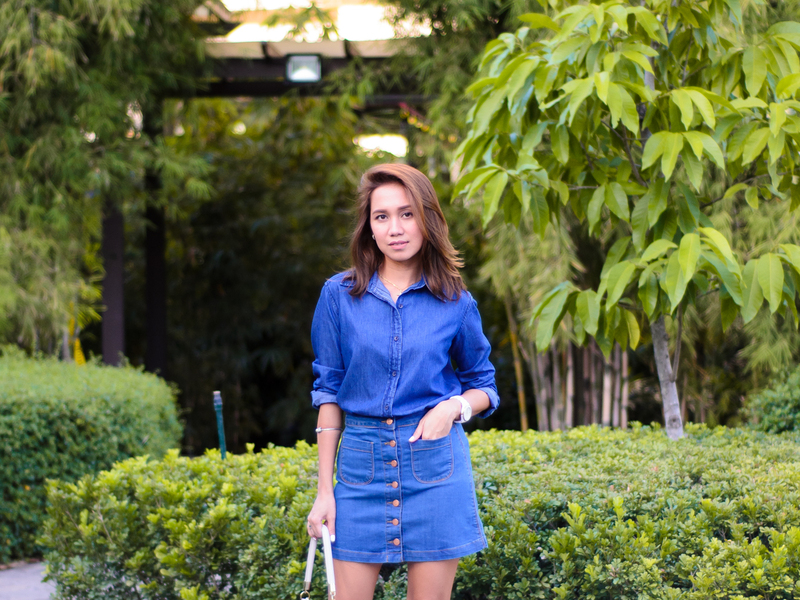 This denim a-line skirt is definitely a good addition to my closet essentials. A-Line Denim Skirt from Penshoppe. Penshoppe will be opening its biggest in the Philippines right here in Cebu! See you all on their opening at SM Seaside City Cebu on November 27, 2015. Follow Penshoppe on Facebook, @PENSHOPPE on Twitter and Instagram as they are giving away P500 worth of gift certificates to 50 lucky winners!